My fiber stash continues to grow. Here are some recent additions. 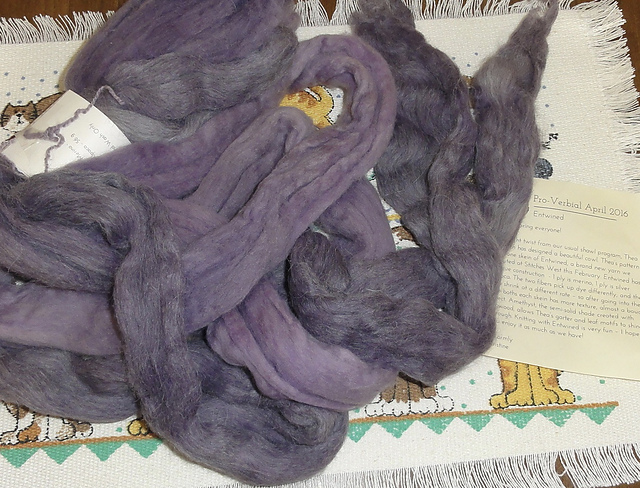 From A Verb for Keeping Warm’s Pro-Verbial Club, April 2016, I received 56g of Merino wool (purple) and 56g of silver alpaca (gray), meant to be spun separately, then plied together. This is my last installment of this club, and I don’t plan to sign up for the next installment. 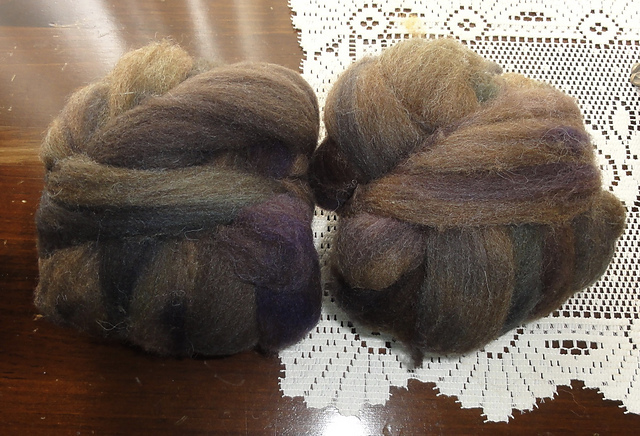 The fiber is gorgeous, but with the exception of this final installment, I really don’t know quite what to do with it. This was something of an impulse buy when I was ordering some things from WEBS. 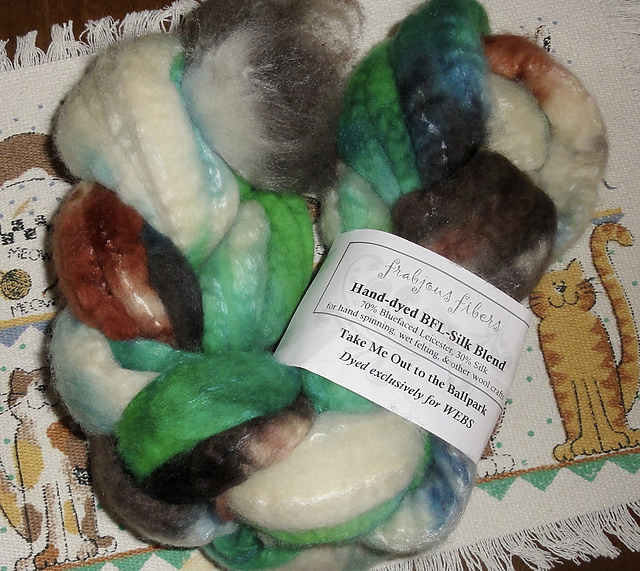 It’s a limited edition colorway from Frabjous Fibers that was offered at an irresistible price, and it’s BFL and silk. And it has a baseball theme. And it’s gorgeous. This is the April installment of the into the whirled Classic Club. The fiber is Cheviot ♡♡♡ and the colorway is Cattywampus. I think the colorway should be called Go Bubblers! because the school colors of the high school where I used to live, Boiling Springs Pennsylvania, are purple and gold, and the school nickname is the Bubblers, in honor of “The Bubble,” the place where a huge underground spring bubbles up to the surface and feeds the lake that you see in the picture at the top of my blog. 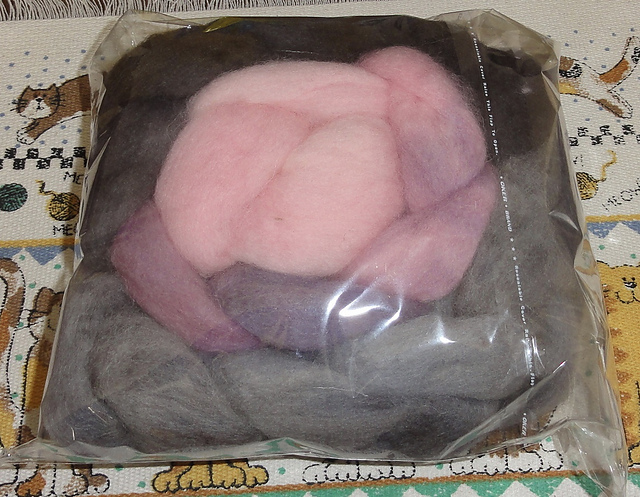 This fiber is Manx Laoghton wool, which is similar to Shetland wool, and just as wonderful to spin. It was dyed in the colorway Big Thaw by Amy King, the brilliant dyer behind Spunky Eclectic. This is the April 2016 installment of the Spunky Club. I’m really happy I chose the double shot for the Spunky Club. 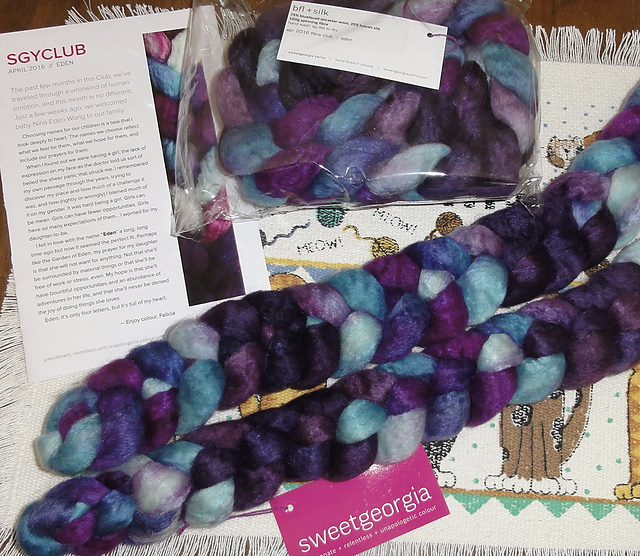 I subscribed to the Spring fiber club offered by the amazing Felica Lo of Sweet Georgia Yarns. Felicia is know for gorgeous saturated colors, and she has never failed to thrill me. This is the first of three installments. 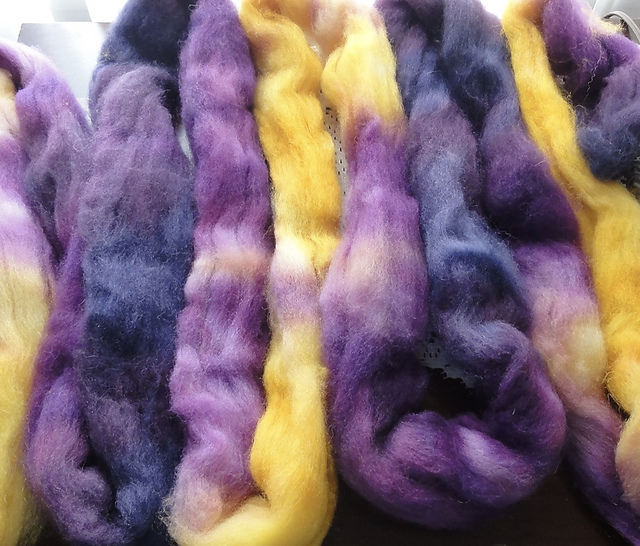 More BFL/Silk. Yum! I made a big mistake. I was browsing on Etsy, and I just couldn’t resist this braid of Cheviot ♡♡♡ from The First Draft. I love the other braids from The First Draft that I have spun, and as a bonus, each braid comes with a small card on which to record all the technical stuff when you spin the fiber and a lovely hand-crafted stitch marker. This colorway is called For Alice, and the braid is 4 ounces. Here’s another braid from The First Draft. I think Lindey is a brilliant dyer. Not only are her colors gorgeous and perfect for spinning self-striping yarn, a lovely fractal, or a marled yarn, the fiber is handled gently during the dyeing process. I’ve yet to get any that is compacted or felted. This colorway, which is called Indiana, reminds me of summer–blue skies and sunflowers. 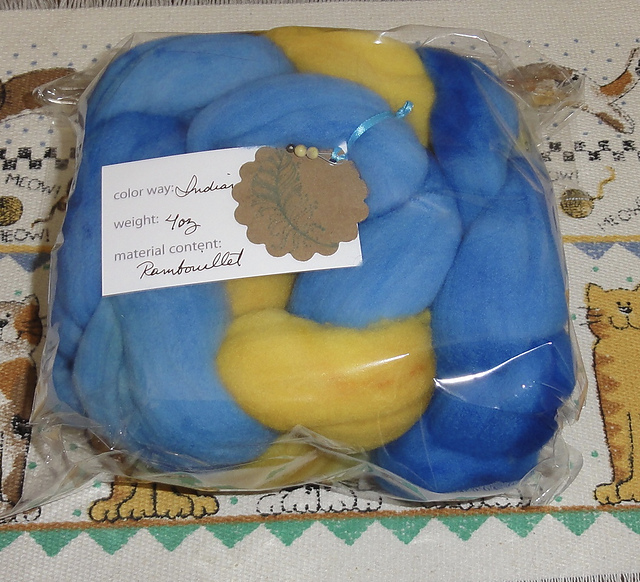 The fiber is Rambouillet, which I have never spun before but want to try. I couldn’t resist this happy colorway. Yes, this is another braid from Lindey at The First Draft. 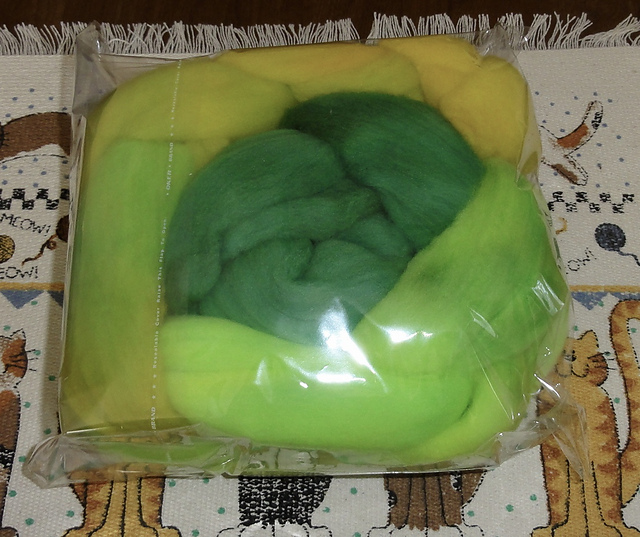 This one is a gradient called Spring Shoots. The picture doesn’t do it justice. I plan to split the braid to make four skeins of a chain-plied gradient yarn for fingerless mitts and maybe a matching hat. If I don’t have enough yarn for a hat, I should be able to make a second pair of mitts. I probably shouldn’t mention that I have also purchased yarn recently. Oh, my!